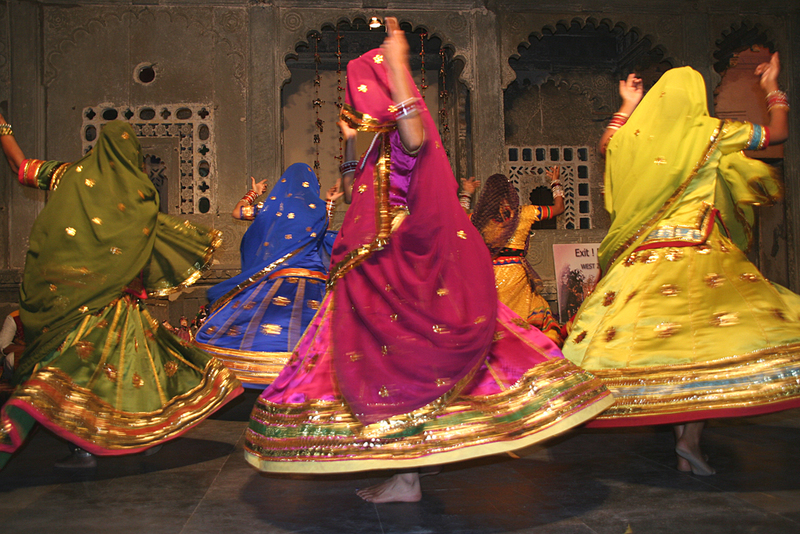 The colors, designs and swirling robes of Rajasthan have mesmerized Indian and Western women for years. Because of the folk dance form of Ghoomar, which originated in Marwar, historic capital in the south-western of Rajasthan, outfits like Chaniya Choli or Ghagra Choli have become immensely popular. Ghoomar, a traditional Bhil tribe folk dance is not just an act of singing and dancing, but is a symbol of womanhood, a rite of passage in which young girls participate to declare that they are now stepping into the shoes of a woman. What makes Ghoomar and its accompanying attire even more alluring is the use of dance step ‘Ghoomna,’ in which young women twirl around with their Chaniya or Ghagra and the whirling effect produces a kaleidoscope of colors. Originally performed for worshiping Goddess Saraswati, the dance of Ghoomar of Marwar is now identified with its bright outfits and graceful inclinations. 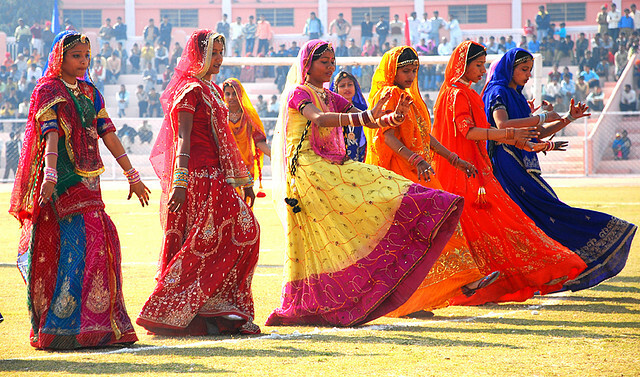 Marwar, also known as Jodhpur region, is popular for Ghoomar, wherein Rajasthan communities perform the dance on occasions such as rains, Diwali, Holi and as a rite of passage. The dance form, which was developed by Bhil tribe now, connects different Rajasthani and Rajput communities, who have adopted it as a show of solidarity. It features men singing and dancing together while using graceful gestures such beating palms, finger snapping, and twirls. It is perhaps mostly popular for its folk attire- an ensemble of a Choli (a blouse), a Ghagra or Chaniya (Swirling skirts of full or knee length) and translucent veils that cover the face. 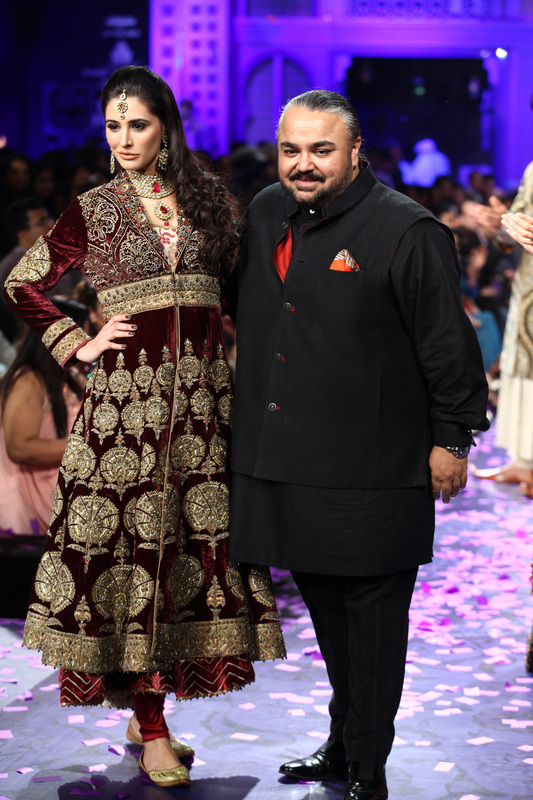 Silver ornaments, Kundan Jewelry and mirror necklaces were used as accessories. 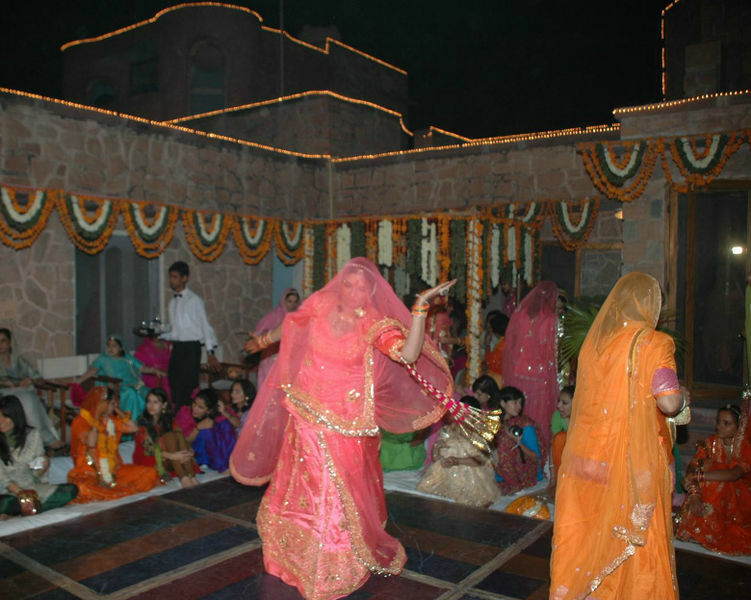 As a symbol of womanhood, Ghoomar of Marwar is generally performed at weddings and its various ceremonies such as Ladies Sangeet. On the day of performance, women are seen wearing beautiful Chaniya in colors like red, green, orange, pink or blue with heavy embroidery or mirror work along with blouses. A veil covers the head and is adorned with mirror work, ‘gota’ or lace on a translucent colored piece of cloth. The skirts are wide to ensure that they twirl and flow during the dance. 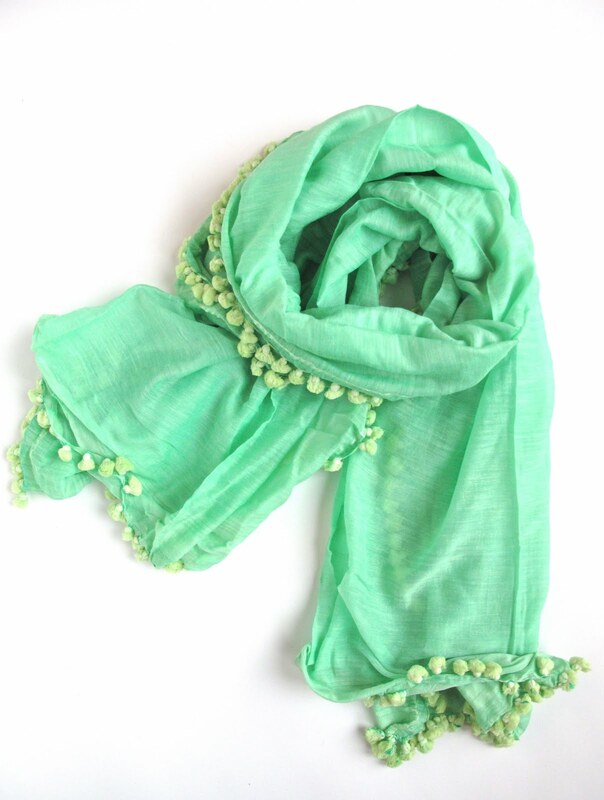 Mostly, cotton Chaniya are selected for the purpose, but depending upon occasion, silk or chiffon may also be used. Zari work is common for Chaniya and veils, while the blouse or Choli is mostly singular colored and plain. 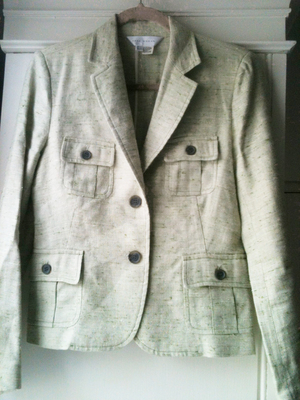 Embroidery and silver work is an indicator of family wealth and also corresponds to the occasion. Colors like red and green with golden embroidered work are widely used because it indicates prosperity and high spiritedness. Ghoomar and the ensemble worn for it are representatives of modernized Indian traditions that signify beauty and grace of a female. Women are originally considered the heart and soul of this dance form. Globally, the dance, as well as its ensemble, has received widespread global appreciation. It is considered that the dress was designed intelligently as it complements the tough and hot weather conditions in Rajasthan. As most of the regularly worn Ghagra and Choli are made from cotton, they make it easier for women to bear harsh weather. The flowing skirts, made in different bright hues are also applauded by fashion pundits who believe that the skirts get their fullest flare when women turn and fill the stage or area with a rainbow of colors. The original outfit featured a knee length skirt, but to give it a mass global appeal, the length has been increased till the ankle so that it could be used as a traditional Indian wedding gown. The increased length allows for more elegance, exudes sophistication and provides an opportunity for innovation, such as fish cut at the end, A-style or slits on the side for a more modernized look. Similarly, instead of long blouse, midriff blouses with thick Zari work are used. In certain cases, translucent veils are exchanged with heavily worked opaque veils if they aren’t used to cover face. Currently, Ghoomar dance’s outfits are in huge demand by both young and old, especially for weddings, family functions, and festivals. • Over the years, Ghoomar has a dance form has evolved and now includes several Rajasthan communities. • Special folk songs accompany the dance. 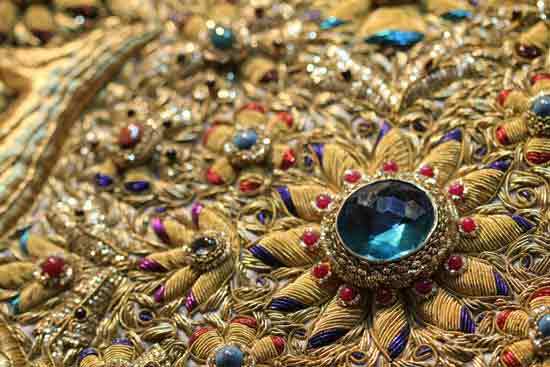 • The amount of Zari or mirror work on silk Ghoomar outfits indicated the level of wealth in a family.